I uploaded the photos of my Mom’s 80th birthday party. My great-niece actually snapped most of the photos. 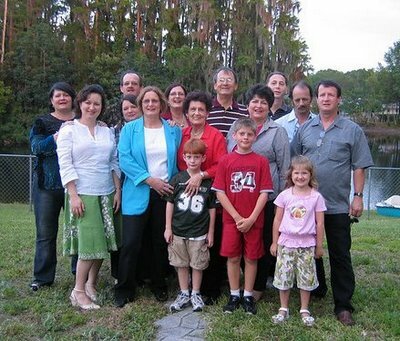 Here’s one that shows me, all of my brothers and sisters, our mom, a great niece and a couple of my great nephews. Going to Tampa for my mom’s 80th birthday party & family reunion. 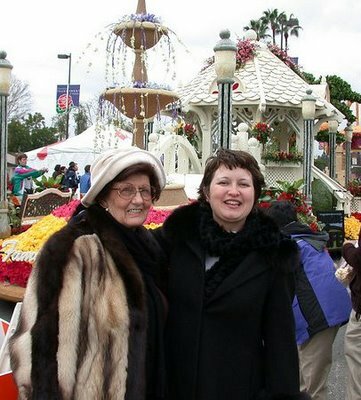 Here’s a photo of my mom and I at the 2005 Rose Parade. It speaks to the non-scientist person’s human concern for the world. Conservation is presented as something that can be helped by an incremental contribution. It elicits a feeling of membership as we gather in groups to root for one turtle or another. A sense of ownership and/or membership is a powerful component of a conversation for action. It is an affirmation of life; these female turtles just laid eggs, after all. This positive message underscores the threat of extinction at the same time that it focuses on the goal of life. It utilizes the human predilection for competition, rather than bemoaning it. When you stop to think about it, the turtles aren’t racing each other. The human narrative, however is one of competition, therefore we’re calling it a race. Understanding the human situation and working within it is a wise move on the part of people who desire to change the course of huge populations of humans who are affecting ever smaller populations of leatherback turtles. I applaud the race organizers, especially TOPP Tagging of Pacific Predators. It looks like they led the charge and essentially came up with the idea. Brilliant strategic marketing! 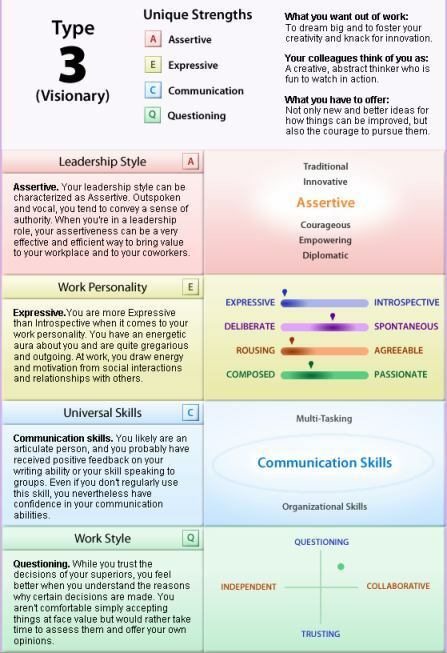 I took the Jasper Strengths Test and got overlapping results from the Strengths Finder test in Now, Discover Your Strengths by Marcus Buckingham and Donald O. Clifton. Here is an image of my test results. Three people I care very much about had very bad weekends. Two of my good friends have had personal tragedies that occurred over the weekend. I helped in the best way I could for all three: visiting, listening, cooking, and generally “being there.” My Easter wish is for resurrection of mind, body, and spirits for all three. Michael and I started INeedCoffee.com 8 years ago today. Go visit INeedCoffee now. Years ago, I used the site to showcase my skills as a technical writer. INeedCoffee used to have a very comprehensive set of help files for the back-end; which I’d show as a part of job interviews. How funny is that? Over the years, I’ve played many roles…. Here’s looking forward to eight more years of Caffeination Information! You read the title of the blog post correctly. First, let me start by saying that this is not an April Fools Day joke. You might want to check the temperature in hell to see if it has frozen over. That’s right folks… about a week ago, with no warning or precedent, I was challenged participate in a 5K, and I took the challenge. I didn’t really train for the race. I literally haven’t even attempted to run a mile since grade school. No joke, it has been that long. Even then I never ran the mile, I walked at least part of it. 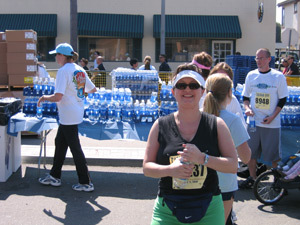 Here’s a link to the photo gallery to prove that I did it. Gracias to MAS for taking the photos. 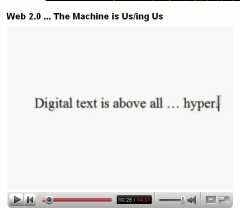 You are currently browsing the Lura.net Blog archives for April, 2007.